Note by webmaster Tim: thanks to your generous donations to the Ride of Silence some of the RoS board members and advisers have attended some important bike advocacy events over the years. This year Chris was unable to attend the NBS so Elizabeth carried the message to the Belly of the Beast for us. 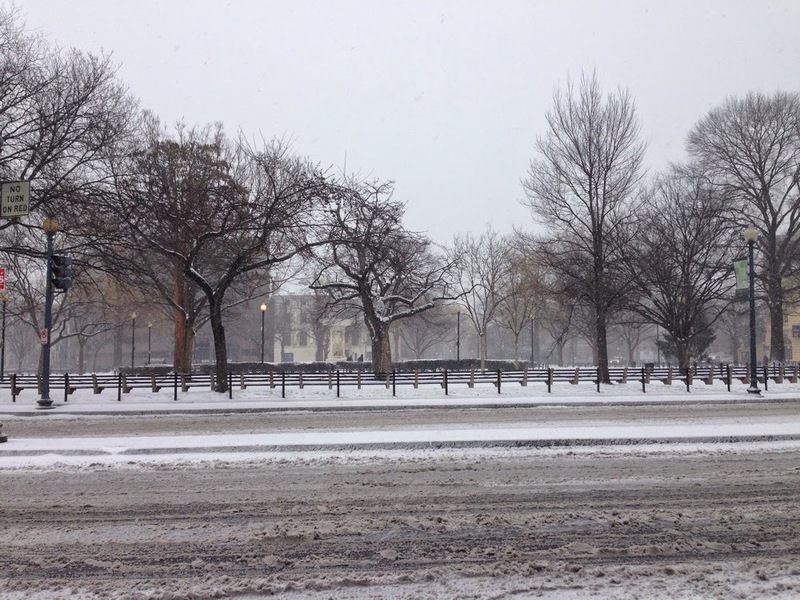 Washington, DC may shut down on snowy days, but we cyclists met -- some even arriving by bike! -- for this year's Summit. It's my first Summit not getting around by bike, but the streets were a mess (and I was still in recovery mode from a broken wrist earlier in the winter). 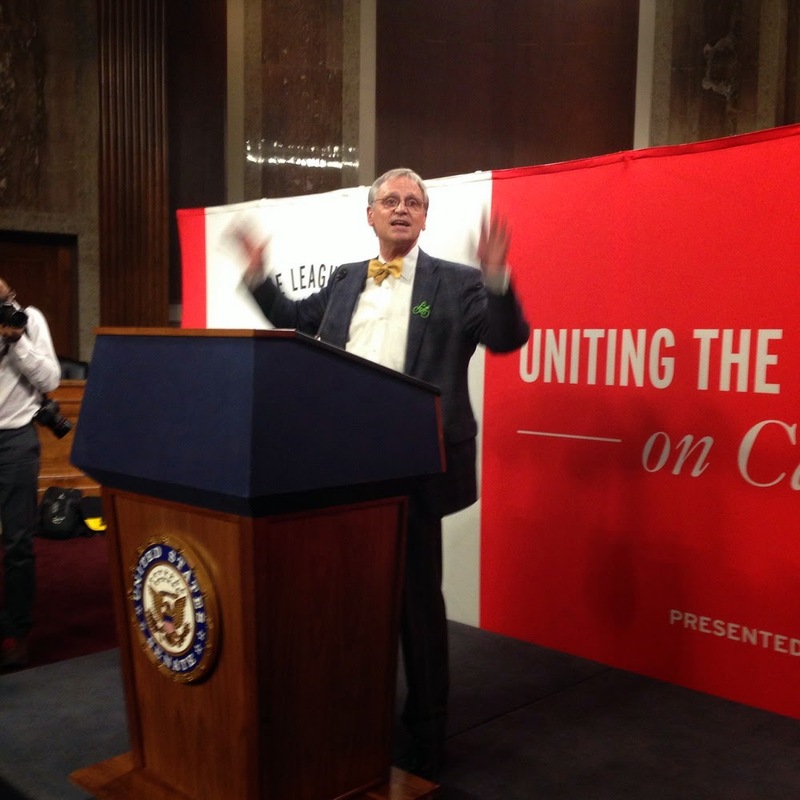 This year's National Bike Summit met in Washington, D.C. earlier this month with the theme "Uniting Spokes" joining 650 bike advocates and enthusiasts together in one voice on Capitol Hill "to advance bicycle safety, funding and equity.equity joining cyclists together," as the League of American Bicyclists reports. For the past three years, Ride of Silence has been a presence at the Summit and this year was no different. I arrived in D.C. on the Sunday before the start of the full Summit, to attend the Women's Forum during the day on Monday and then stayed for the National Bike Summit that began Monday evening. When I took a look at the agenda this year, I noticed with satisfaction how the heavy focus on not just equity among cyclists but also for cyclists on the roadways and the legalities of enforcement. Overcoming the Scofflaw Perception: Learn how advocates have partnered with police, courts and others to provide education for cyclists who are ticketed for their scofflaw behavior. These successful partnerships teach people how to ride safely and prevent this behavior from standing in the way of progress. Moving Beyond the Bikelash (Congressional A): Social media, old and new journalism, and even improv comedy, can change the conversation faster than you think. You just have to help it along. This session will show you how to beat the bike lane backlash -- and have fun doing it! The Role of Enforcement in a Vision Zero Strategy: Law enforcement isn't always a bicyclist's best friend and justice for bicyclists and pedestrians hit by cars is rarely served. Hear from lawyers and advocates who have changed the law and worked with enforcement agencies to ensure proper legal protection for cyclists. Click here for their presentations. on the Hill on Wednesday evening. While at the Summit, I did my best to reach out to all of you via tweets (via @RideOfSilence) and posts to our Facebook page (www.facebook.com/RideOfSilence) as much as possible. 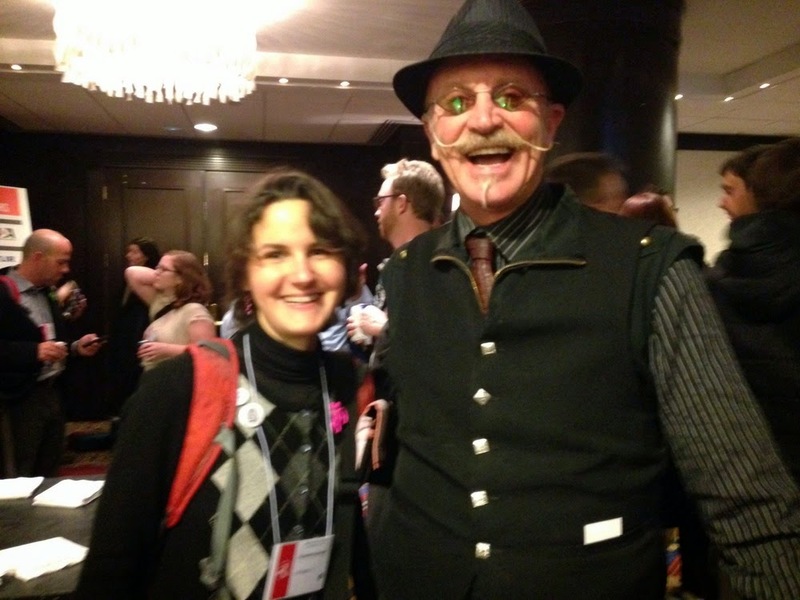 Of course, an added perk of attending this Summit is meeting (again) the likes of Gary Fisher and having a personal chat with League director Andy Clarke about our initiative and hear of his personal support for the Ride of Silence. We are heard and we are making a difference in so many lives, but we still have work to do, as clearly recognized by the content of these Summit presentation. Yet the most rewarding aspect of the Summit came on Wednesday when all 650 of us advocates took our message to Capitol Hill. As I met with the Illinois representatives, I invited each to attend a Ride of Silence and was impressed with their support for our mission. Strolling the halls of the House buildings, I'd see an occasional person wearing a bike pin and would ask how their day was going and everyone was so energized. 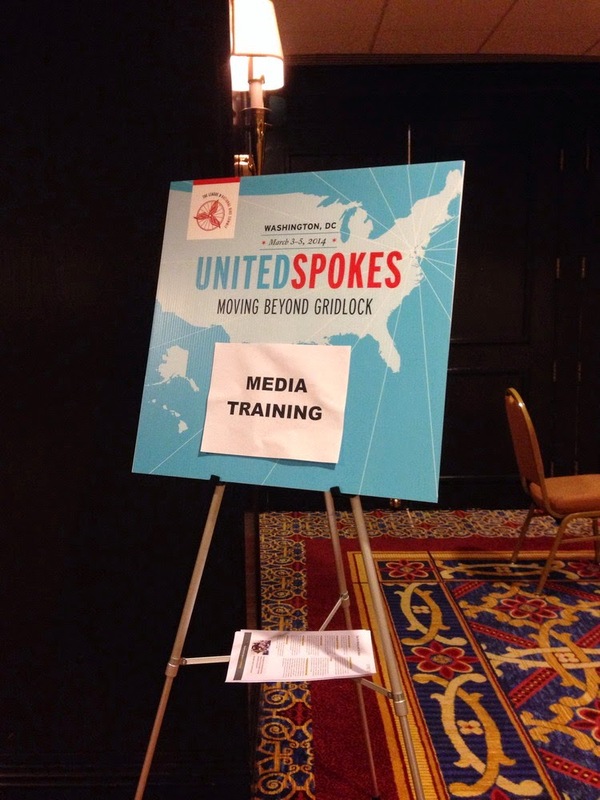 The movement of United Spokes does not end after the Summit; in fact, we who attended the Summit bring our energy back to you and ask you to unite with us to spread the message for bike equity in your own community. Working together for bike safety and riding together on May 21 for this year's Ride of Silence, we are UNITED and we do have a voice. Let our voices (in advocacy and in our silent reverence) roar. This past weekend Dave Duffield (organizer of the longest running Michigan RoS event in Westland near Detroit - this will be their 11th year!) and I proudly represented the RoS with a booth among 120 other vendors and organizations at Detroit Bike City Expo. This was the 3rd year for this fledgling event which has become part of the N. American Bicycle Week as of this year, one of 4 days of great bike-related events. This was another event where the RoS was represented thanks to donations to the RoS. The RoS booth had a lot of visitors many of whom said they'd participated in RoS events and were eager for the 2014 event to come around. Fortunately we had Dave's laptop there, which was running Mark Hagar's excellent updated RoS Powerpoint for 2014, so we could also look up info. on events around Michigan and elsewhere for visitors. We had one visitor who had just moved to Detroit-land from Guadalajara, Mexico, who had ridden in the RoS event there a number of times and was delighted to learn about events in the area. Keith Webb, an organizer who has done events in Maryville, TN and now Toledo, OH, for a bunch of years, stopped by to say Hi. Steve Roach, a multi-year (at least 5) organizer in Detroit's Belle Isle, briefly visited too. 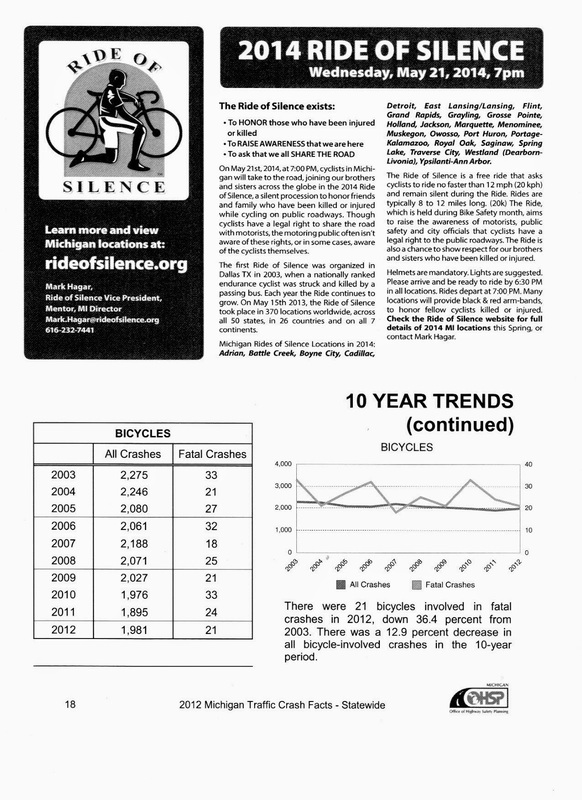 We handed out many fliers which I had put together from an annual ad we run in the League of Michigan Bicyclist's ride calendar (thanks to the generous courtesy of the LMB) and some 10-year bicycle crash stats from the web-based Michigan Traffic Crash Facts tool. Image to the left is a scan of the flier if you're interested in knowing what it looked like. 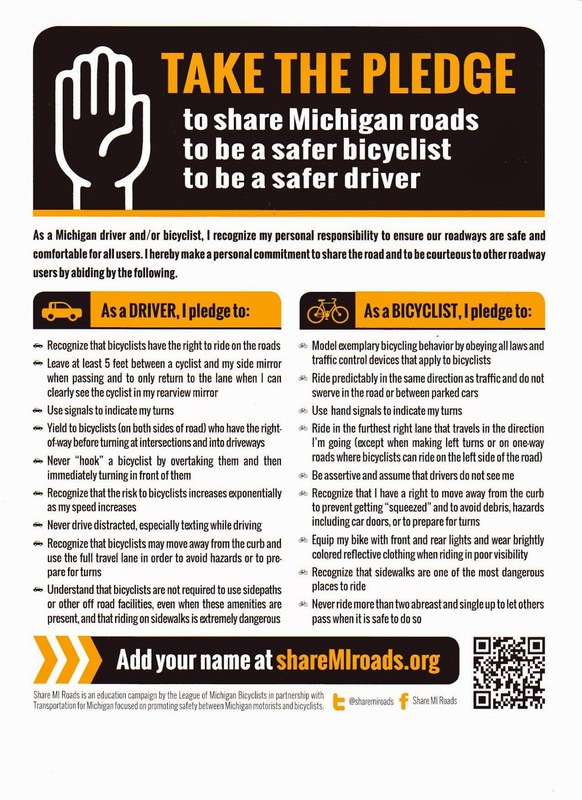 To the right is a scan of another flier we handed out; the Take the Pledge campaign is a recently launched initiative that every state bike advocacy group should copy. It encourages both bicyclists and motorists to adhere to basic rules of the road and common courtesies to each other. 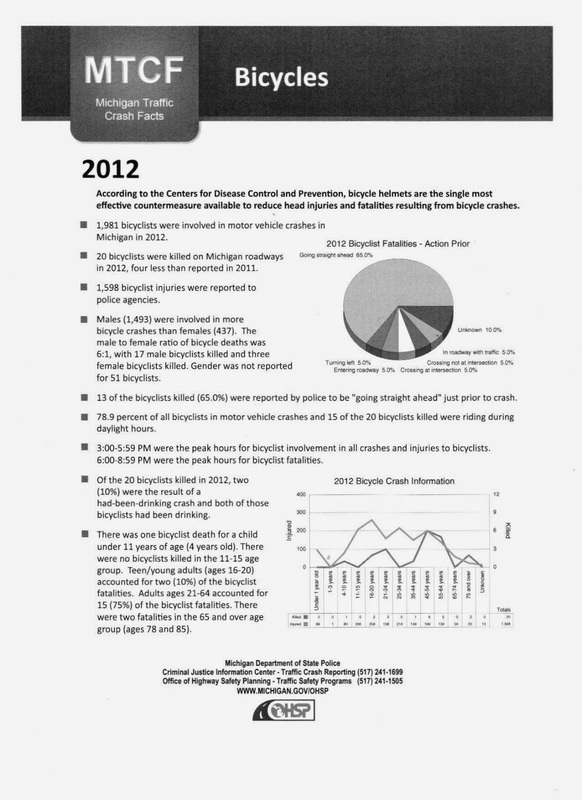 One other flier I made available was a detailed summary of the latest year (2012) bicycle crash statistics so people can better understand the nature of these crashes. See that handout below. Now is the Time to Register Your Event for 2014! 50 days until May 21! You don't have to wait until every detail is finalized; register whatever information you have now for your event so we can make sure your event is counted! (You can send updates to the webmaster when you have them.) Last year we had a record year and this year we're on pace to break THAT record, so let's do it! Here's a link to our simple registration form. Also, if you completely forgot to submit your post-event report for 2013, it's NOT TOO LATE! We only have 43% of our events submitting reports which is unfortunate since we'll never know how all our events did unless you submit something. If you're not sure a report was submitted go here and easily check. Use this easy-to-use form to file it along with links to photos, articles, videos and then up to 10 photos too (on pg. 2 of the form). Thanks everyone! and all the best in 2014! Crooked Tan Lines: July 18: Remember?